Small nerve fibers, either sensory or autonomic, are commonly involved in various immune-mediated and infectious disorders. More than 60% of patients with Sjögren’s disease or systemic lupus erythematosus and a third of patients with sarcoidosis have evidence of small fiber neuropathy on history, examination, or skin biopsy. Patients with antibody-mediated disorders, such as voltage-gated potassium channels, commonly complain of symptoms suggestive of small fiber neuropathy. On physical examination, the presence of non-length-dependent pattern of sensory loss suggests an immune-mediated disorder, while patchy nerve fiber involvement suggests a vasculitic etiology. Infectious disorders such as leprosy, hepatitis C virus, and HIV virus remain common causes of small fiber neuropathy. 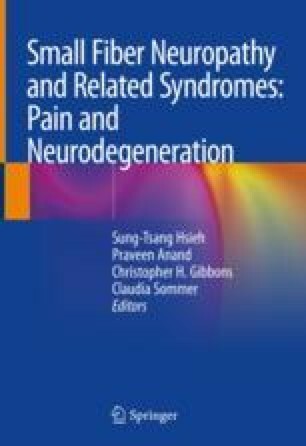 Therapeutic interventions will focus on treatment of the underlying disease with symptomatic management of the pain and autonomic symptoms.